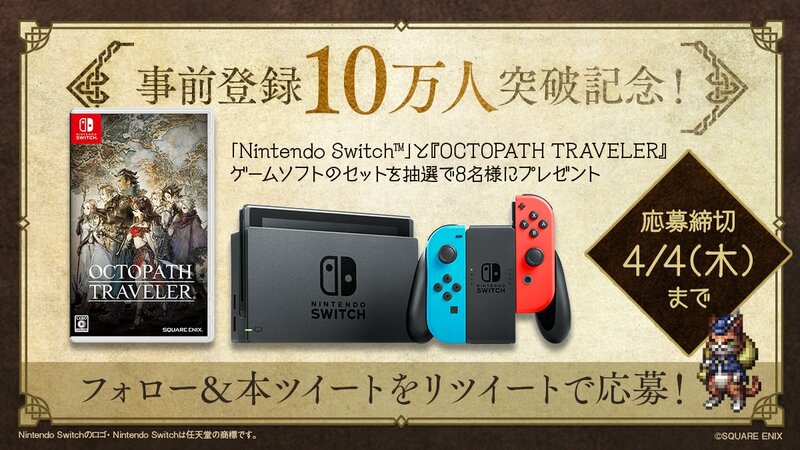 Square-Enix has announced the kickoff of an Octopath Traveler + Switch giveaway in Japan. Square-Enix wants to celebrate a milestone for the upcoming Octopath Traveler: Champions of the Continent mobile game, which they say over 100k people have signed up for. In honor of hitting 100k, Square-Enix will be giving away 8 copies of Octopath Traveler bundled with 8 Switch units. The contest is super simple to enter, as all you have to do is follow the official Octopath Traveler Twitter account, and retweet the contest.